A few weeks ago I shared that I was going to be participating in the Christmas In The Country Gift Exchange and today I get to reveal what I received from my secret Santa, as well as what I sent as my gift to Darcy! The gift that I received was from Amber Rugan of A Gentle Word. Amber is from Kansas and writes about faith, family, food, farming, fun and photography. I wasn’t familiar with Amber’s blog so I was looking forward to meeting someone new and learning more about her! Amber’s Secret Santa gift to me came in two stages. 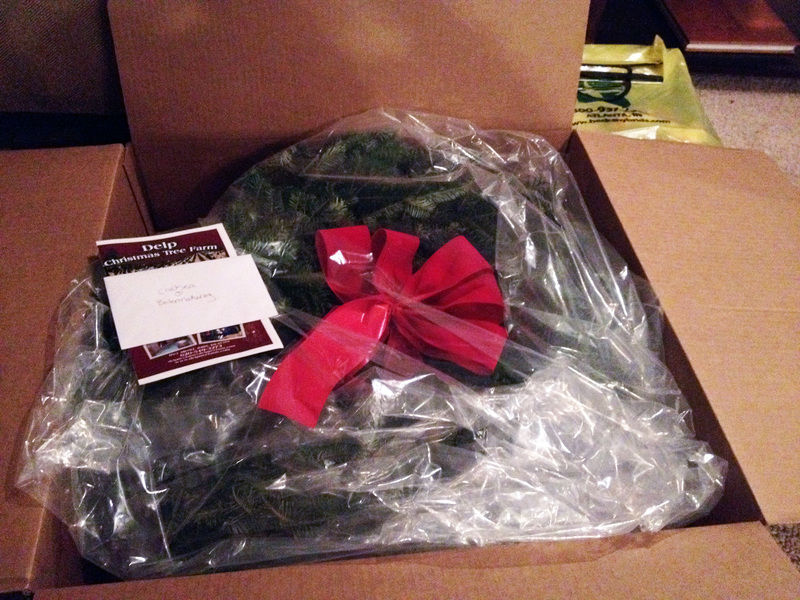 First I received this large box on my doorstep which contained a real Christmas wreath from Delp Christmas Tree Farm, a local farm in her area. How neat! We always had a real Christmas tree when I was growing up so this was a nice little reminder of home for the holidays. She later revealed that she tried to send me a wreath with Purdue colors but it didn’t work out. (That would have been awesome though!) But the wreath she ended up sending worked perfectly and was right in time to add some more festive decorations for the Christmas Sweater Party we had at our house! The box the wreath came in didn’t have much description of who it came from besides her name so I was intrigued to learn more! A week or so after that I received Amber’s second package. 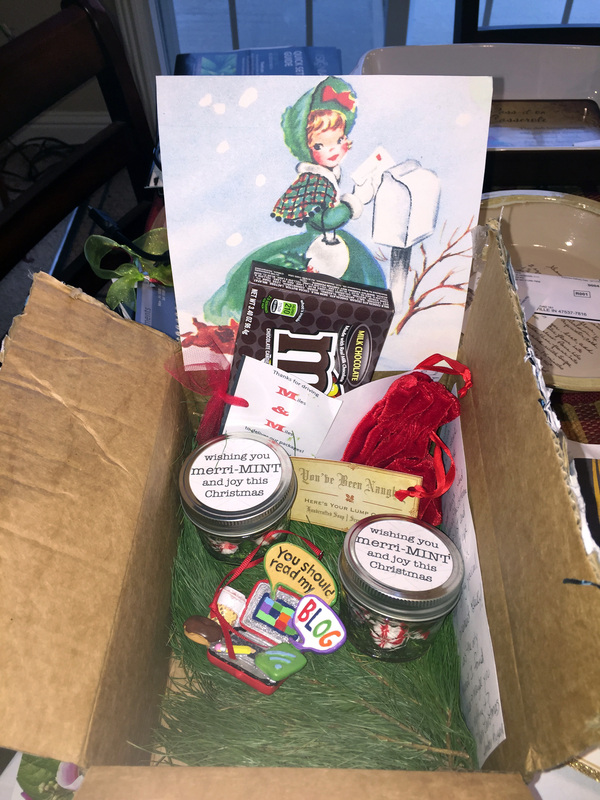 It included a very sweet note sharing more about her and the story behind her gifts, some cute mini jars with mints in them for me to share, a package of M&M’s to share, a blog ornament and the infamous Christmas Gift Exchange lump of coal! (I’ll explain more about that in a minute). 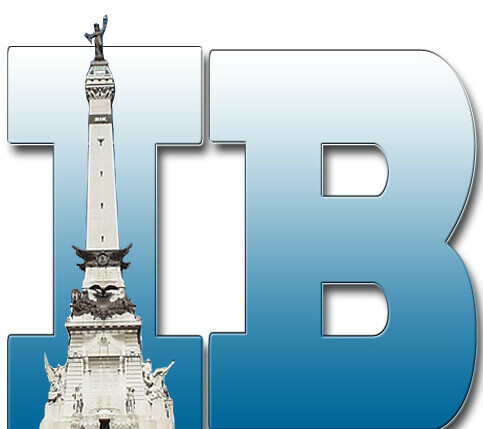 Amber joked that the blog ornament was tacky and it was the only one that she could find. But I think it’s just perfect. I’ve never even seen a blog ornament before so great job to you, Amber, for even finding one! 🙂 I already have it hanging up in my office at home! Alright, now for the story behind the lump of coal. Back in 2013, this bag of coal was gifted to Amber as part of her Gift Exchange present by Colby Miller of MyAgLife.com. It serves as a light hearted reminder that coal-deserving sin places us on Santa’s naughty list. But thankfully, naughty boys and girls are offered the gift of Jesus. In reading the tag closer, I realized it is actually a bar of soap colored and scented like real coal, but what a creative reminder about the real reason for the season! You can read more about Amber’s experience of receiving the coal here. On the back of the tag it has the history of where this coal has traveled each year so my job now is to keep it and pass it on to someone next year! 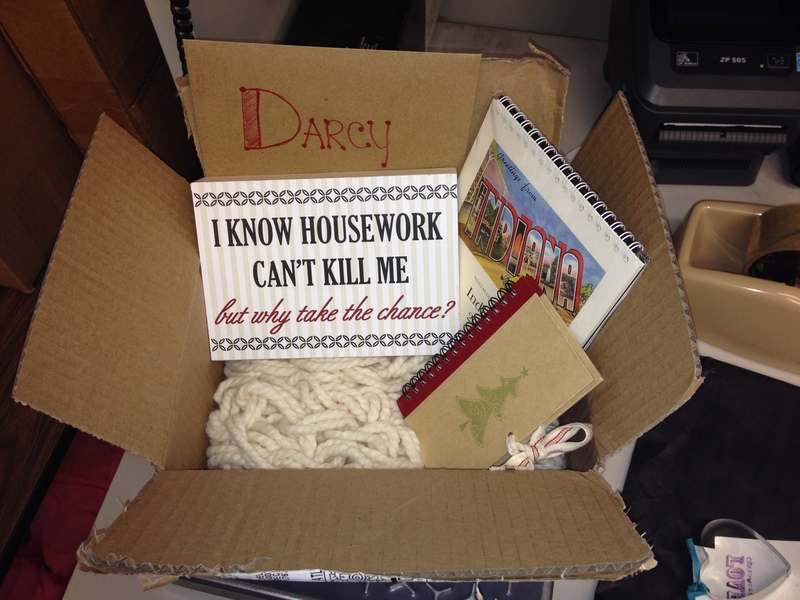 Thank you Amber for all of your creative and thoughtful gifts! I truly enjoyed them and am grateful for the opportunity to meet and learn more about you. I hope you and your family had a wonderful Christmas and New Year and I look forward to keeping in touch! The recipient of my Secret Santa gifts was Darcy Sexson of Success is Reason Enough from Oregon! I had never been to Oregon so I had to do a little research on her blog to find out what type of things she might like. I wanted to send her something local, something fun, and something homemade. I started with a cute calendar from a local shop that featured images from Indiana. Then, in reading Darcy’s bio, it said she isn’t a huge fan of cleaning (who is, really?) and ended up finding the perfect little decoration for her! 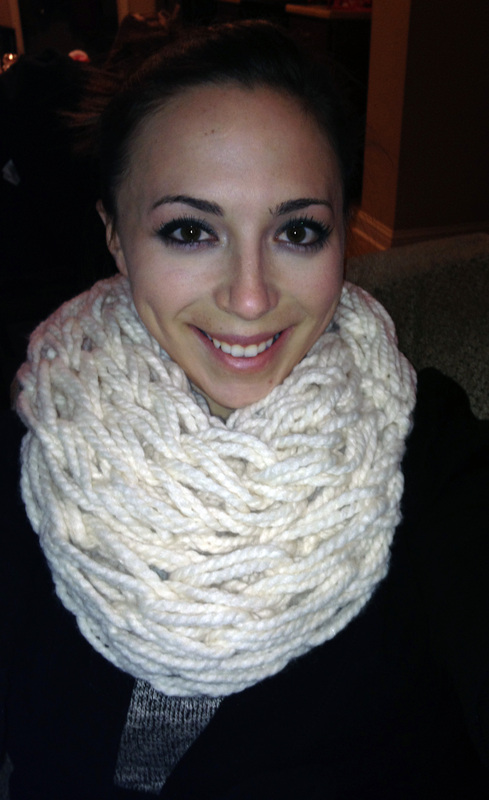 And my homemade item was an arm-knitted infinity scarf! I was really proud of this one because it was my first attempt at making one. It wasn’t the easiest of project at first, but it turned out great once I got the hang of it. Finally, I want to say thank you so much to Robyn at The Ranch Wife Chronicles, Jamie at This Unchartered Rhoade, Laurie at Country Linked, and Erin at Diaries From the Dirt Road for hosting and organizing this fun event! To see all of the other bloggers who participated, click on one of the host’s links above for the link up! Posted on January 7, 2015, in Agvocating, My Life and tagged A Gentle Word, Ag, Ag Bloggers, Amber Rugan, Arm-knitted scarf, Christmas in the Country, Country LInked, Delp Christmas Tree Farm, Diaries From The Dirt Road, My Ag Life, Ranch Wife Chronicles, Sexson Charolais, Success is Reason Enough, This Unchartered Rhoade. Bookmark the permalink. 10 Comments. I knew Amber was thinking of passing on her lump of coal. What a fantastic idea to do it this way and remind us all once again the gift of Jesus. Thank you for participating Chelsea! It was fun having you and all of the other fantastic blogger/agvoctes this year. Here’s to a healthy and happy 2015! You’re welcome, Laurie! Thanks to all of you for organizing it! It was super fun! Chelsea! You have an amazing ability to make others look good! I have been inspired by your blog to have more fun with history and food as I share both with my family! Happy New Year! And it means a lot to hear that my blog has inspired you! What I have read of your blog so far inspires me as well. It’s always interesting to read about people from other parts of the country and how they live day to day life. So thank you for sharing and continuing to write your posts! Hope you have a Happy New Year too! Ok, somehow I totally missed (or totally forgot) about the coal!! I didn’t realize we had an infamous traveling item in the gift exchange! How fun! Now you’ll just have to participate again so that it can travel on 🙂 Thanks for participating! I love the idea of the traveling lump of coal! Happy new year. 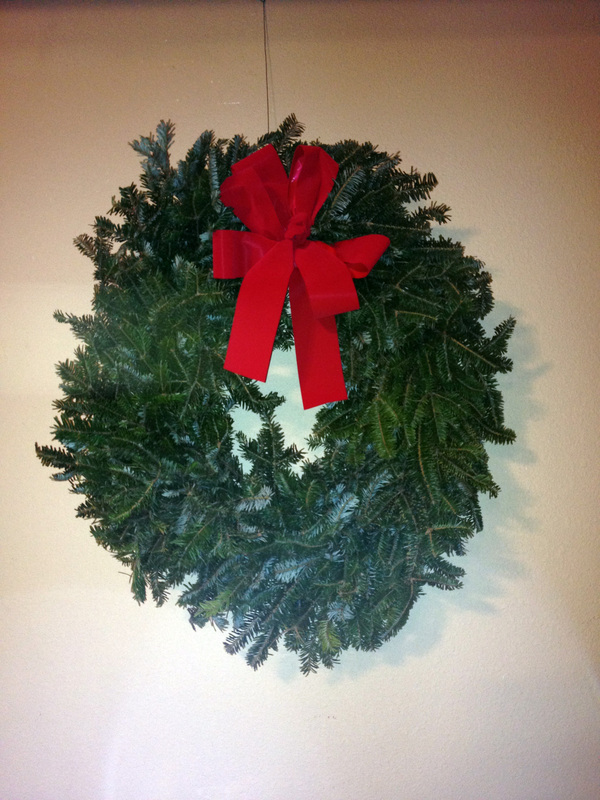 Love the wreath you received – what a great idea! And again, thank you for the wonderful gifts. 🙂 Happy New Year! You’re very welcome, Darcy! 🙂 Glad you enjoyed them! Happy New Year to you too!